It's been a tough week, and I've been talking with many of you about recovery and how to alleviate muscle soreness and other aches and pains. Foam & lacrosse ball rolling and mobility work - you can do this at home as well as at the gym. HYDRATE - with plenty of water. As the summer heats up, use coconut water for added electrolytes. Avoid sports drinks high in sugar (and the diet versions with artificial sweeteners!). Limit caffeine to black coffee or tea, and don't drink it after noon. Sleep - Seven to nine hours in a PITCH BLACK dark, cool room. Nutrition - how you eat throughout the day and ESPECIALLY what you take in immediately after your WOD is important. Get a good quality protein supplement into your system within 45 minutes of finishing a WOD, and then eat a full meal (protein, fat and carbs) 60-90 minutes later. Supplements - fish oil and magnesium citrate will both aid in recovery. Fish oil is high in Omega 3 fatty acids, which reduce inflammation of all types, BUT these fatty acids are very fragile, so it's important to invest in a quality fish oil supplement. Epsom salts baths and contrast showers - take a warm bath in Epsom salts, or try a contrast shower (5 cycles of 1 minute hot, 1 minute cold water...this is also an excellent hangover cure... or so I've been told). Rest days - listen to your body and take a day off when needed. A yoga class, a leisurely stroll through the park or an easy bike ride are all great activities to do on your days off from CrossFit. *We sell Stronger, Faster, Healthier fish oil and protein in the Pro Shop. Check out some FAQ about their fish oil and protein here, or ask Lis for more details. Disclaimer: we'll never sell anything in the Pro Shop that we don't use ourselves. This is good stuff. What are your top recovery tips/tactics? Share them in the comments! Join us this Sunday at 10 for our FREE PARK WOD (open to the public and suitable for all skill levels). We'll meet in the meadow near Park Tavern for a WOD, THEN we'll head over to the sand volleyball courts to play HOOVER BALL. Don't worry, if you don't know what Hoover Ball is, we'll teach you. Carlos is a pro and will be coaching the crew this Sunday!! So meet in the meadow at 10 am AND/OR at the sand volleyball courts at 11 am. See you Sunday! Rest between row/run equal to the same amount of time the previous row/run took. If you did Murph on Monday, I recommend rowing. If you rowed on Tuesday, I recommend running. Grand Opening Party is Saturday, June 16th! I can't believe this was the first video I embedded on our blog. BUT we can't WOBBLE until we get 500 FANS. 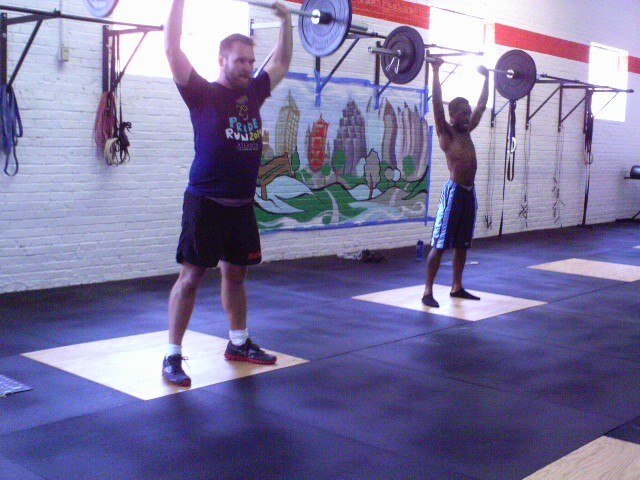 Please share our page on Facebook and help CrossFit Midtown hit the 500 fan milestone! Rachel from the new Lululemon Howell Mill store is hosting a goal-setting workshop at CFM on Wed, 7/11 at 7 pm. We'll work on some short- and long-term vision building and goal setting. Mark your calendars now to set some BHAGS (awesome acronym, right? 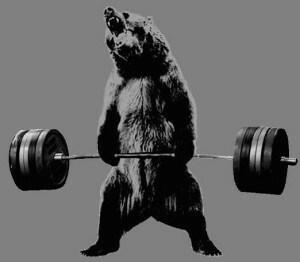 Big, Hairy, Audacious Goals!). Did you know we do a free WOD in the park every Sunday at 10 am? 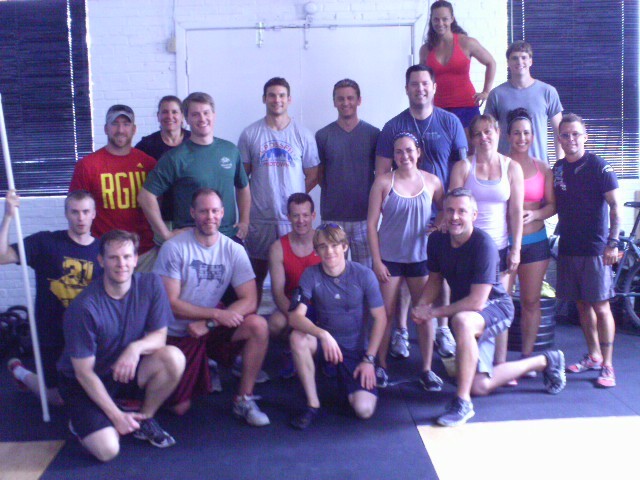 Join us this Sunday at 10 for a WOD (open to the public and suitable for all skill levels). We'll meet in the meadow near Park Tavern for a WOD, THEN we'll head over to the sand volleyball courts to play HOOVER BALL. Don't worry, if you don't know what Hoover Ball is, we'll teach you. Carlos is a pro and will be coaching the crew this Sunday!! So meet in the meadow at 10 am OR at the sand volleyball courts at 11 am. See you Sunday! There is no time component - once you start a round you can rest at any time during the sequence EXCEPT with the bar on the ground. Penalty for dropping the bar mid-round (without finishing your five reps/cycles) is 5 burpees (for each drop), payable at the end of the WOD. Advanced athletes - count only unbroken rounds. No penalties, just drop weight or try again, until you get all five rounds unbroken. If you're a Silver or Gold member, your journal is waiting for you by the white board. If you don't get one with your membership and want to buy one, they're $18. You are required to track your workouts, so if you don't get a Success Journal, invest in a notebook of some sort. Starting TODAY you are as accountable as your coach for knowing your results and scores. Details and sign up sheets are up in the gym. Sign up now for Food as Fuel (Sat, 6/9 - noon-1:30; free to members) and the Fran Challenge (Prelims Sat, 6/16 - AM classes; $30 to participate...includes t-shirt, prizes and finals party). Goals... are due today by midnight to Lis. Email Lis if you need help. Hit the deadline or hit the deck for some buuuuuuuuuuuurpees! Thanks to all the Memorial Day Murph-ers! We had 13 people tackle Memorial Day Murph. Thanks to the drop-in visitors who donated, we raised $180 for the Wounded Warrior Project. ...are due tomorrow. If you already sent yours in, THANKS! You'll hear back from Lis today. If you haven't sent your goals in yet, DO IT! They're due by midnight on Wednesday. 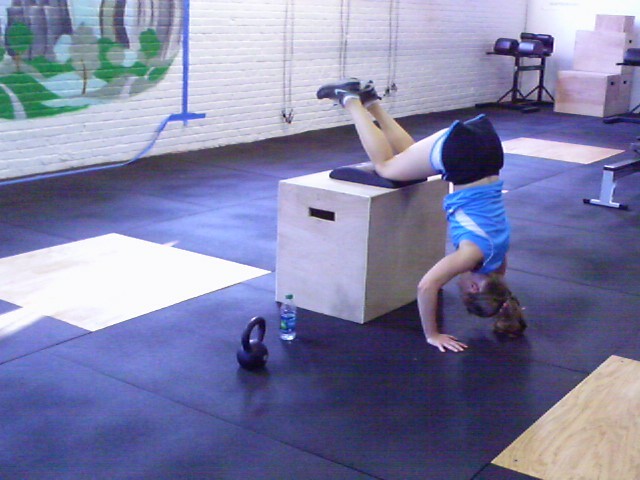 Carolyn tackles pike handstand push-ups. Join us Monday for a noon WOD to remember fallen American hero, Navy Lieutenant and Medal of Honor recipient Michael Murphy as we do the famous CrossFit Hero WOD MURPH. One class Monday: 12 noon. Drop-ins are welcome, in exchange for a $20 donation to the Wounded Warrior Project. We'll have only one class Saturday - at 10 and one class Monday - at 12 noon (see above). 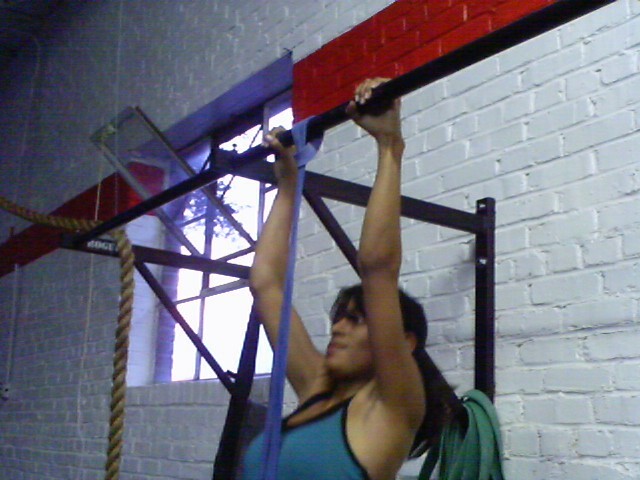 Check out Crystal and her new GUNS killing some pull ups! Crystal just left on vacation, but will be joining group classes when she returns. All members got an email from Lis yesterday about your summer goal-setting. Please take the holiday weekend to think of who you will be by Labor Day...set some specific, measurable goals, and send them back to Lis by next Wednesday. If you didn't get the email, let us know. We'll have only one class Saturday - at 10 am. And on Monday we remember fallen American hero, Navy Lieutenant and Medal of Honor recipient Michael Murphy as we do the famous CrossFit Hero WOD MURPH at noon. One class Monday: 12 noon. Welcome Carlos, Vince and John! Alison and Austin killing some ski jumps...along with Geoff and Righton, they made up the biggest class in CFM history Tuesday night! Geoff and Righton hitting the lateral skier hops. Thanks for dropping in, Righton! Check out the mural progress in the background.